What a tumultuous few weeks it has been for football, with serious cases of racism levelled at England captain, John Terry and Liverpool player Luis Suarez, followed by the comments of FIFA president Sepp Blatter who said that there was no racism in football and that any racist insult could be settled with a handshake. However, Blatter’s comments is indicative of a wider problem in British society where racism and racist insults has become part of the cultural norm. The media has been in a frenzy over recent revelations regarding racism in football. It all kicked off with Anton Ferdinand and John Terry. During an argument in the match between QPR and Chelsea, Ferdinand says that he was racially abused by John Terry. Alan Tyers, writing for the Daily Telegraph (Anton Ferdinand racism row with John Terry: timeline: 31 October, 2011) said that video evidence seems to show Terry saying the words “You black……” The FA is investigating these allegations after an official complaint by Ferdinand’s club QPR, and the Metropolitan Police began an inquiry after a complaint by an anonymous member of the public. In another incident Liverpool striker Luis Suarez denied racially abusing Manchester United defender Patrice Evra. He to is under FA investigation. These two particular stories caused a media storm over racism in football, but it was comments by FIFA president Sepp Blatter which turned this storm into a tornado. 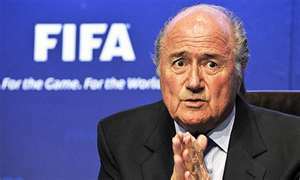 Blatter told CNN that there is no racism on the field and that any racial abuse could be settled with a handshake on the field. His comments caused outrage mostly in England, with prominent football figures like Manchester United defender, Rio Ferdinand referring to him as ignorant and Garth Crooks, former Tottenham player, commented on BBC Radio 5 Live, that Blatter had obviously never suffered from racism. Comedian Frankie Boyle, Carol Thatcher, daughter of former Prime Minister Margaret Thatcher, Anton De Beke, a dancer on the BBC’s Strictly Come Dancing, Australian actor Mel Gibson, singer Miley Cyrus and previous X Factor presenter Danni Minogue have all been involved in racist scandals. Blatter’s comments are not as alienated as we are led to believe. It seems that is shared by many whites. When the BBC’s Top Gear came under fire in February this year after the presenters referred to Mexican cars as racial stereotypes (read Britain’s warped sense of racial tolerance), it revealed how racist language is seen as the norm in Britain. In 2008, a disturbing 64 percent of Guardian readers in a poll said that the term “sooty” was not racist in reference to a race row over Prince Charles referring to an Asian friend of his in this way. Stephen Fry, on his BBC show QI caused anger amongst Japanese people after making light hearted comments of the atomic bombs dropped on Hiroshima and Nagasaki. This is the mindset of many whites in Britain regarding other races so is it any wonder that Blatter is confused why his statement caused outrage. It is such as shame that despite the sacrifices many African men and women have given to forward the cause of race relations the media can always find a black person to contradict racism and dilute the continuing struggle for equality. Pele then went on to say that he never experienced racism to the shock of even the Daily Mail, which mentioned that his claims contradicted his autobiography. Tokyo Sexwale, who was an anti-apartheid activist in South Africa, told the Daily Mail that Pele mentioned many examples to him of painful racist experiences. Why Pele has made this u-turn is debatable, however his comments are inexcusable and a disgrace to those who have fought racism and those who continue to fight racism on a daily basis. Why are black people sometimes their own worse enemy? It would take time to find a woman who claims that she has never been through sexism, a gay person who would say they have never experienced homophobia etc. So why is it black people like Pele can be found by the media? These modern uncle toms do not do themselves or black people any justice and just serve to normalise racist behaviour. Where the investigations will lead regarding Suarez and Terry will be very interesting. Whether racism will ever be kicked out of football is debatable. What we can be sure of however, is that racism is a problem deeply rooted in British society and culture and until this is addressed honestly with no stone unturned black football players will continue to be racially abused. This entry was posted in Sport and tagged Anton Ferdinand and John Terry, Luis Suarez denied racially abusing Manchester United defender Patrice Evra, racism in football. Bookmark the permalink.